If you are planning on selling your old Washington, DC house, or its already on the market, one tip that experienced Realtors and Real Estate agents successfully utilize is to commission a complete history of the house. In this buyers market, its the one aspect that might make your house stand out with an extra bit of cache. If a buyer knows about the history of your house, they may just fall in love with the past social aspects and important people that lived there in addition to falling in love with your new Viking range. A complete history costs less than a single newspaper advertisement, and if done right, it will include information on your architect, builder, owners and renters, and any changes that have been made to the house over the years. You can see good examples of houses histories here. Kelsey & Associates has been doing this in Washington, DC for over 15 years, and can usually complete a house history in less than 30 days, and combine a fascinating array of deeds, vintage pictures, biographies, building permits, census details, newspaper searchers, passport applications, ships registries, etc. Sometimes even locate a living relative of your home's first owners; they are the people that have those family scrap books that show life in and outside of your house 100 years ago or more. Those kinds of pictures never make it into public archives. 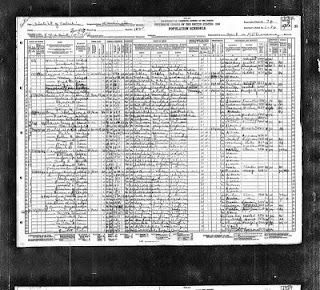 Copies of your house history can be printed out for open houses, or a pdf created for use on websites. You never know who or when someone famous once lived or even rented a room in your DC house, and Real Estate agents agree that every house has a history, large or small. If your listings include vague language like "circa 1900" or "elegant architecture," a house history can change that to "built in 1912 by noted architect George E. Cooper," or "once home to Ice Cream millionaire Jacob Fussell." Which house would peak your interest more? Find out how much it would cost to research your house history today! So while at a party over the weekend after being introduced as a historic preservationist, a new acquaintance complained how expensive it was going to be to replace their slate roof. Their contractor estimated $20-$25,000. I told them to get another contractor. Why? Slate is hung on the roof with a single large hole and a nail; working from the top down, its easily lifted off the nail and can be carried and assembled on the ground while the sub-roof is replaced and the gutters renewed. 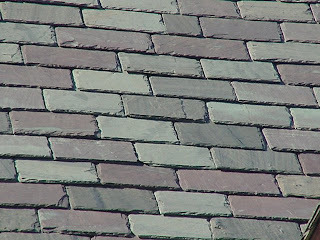 You will loose about 10% to breakage, and you should plan on buying about 10-15% new slate for the reassembly....these new slate should be placed on a section of the roof themselves, as they are likely no to match the old slate exactly; just have them put on dormers or a small pitch of the roof. If the old slate is painted or has roofing tar on it (gasp) like it was on my old 1879 house in Washington, it can be flipped over when it is replaced on the roof. It your roofer wants you to replace the entire roof of slate, run. They want to get the profit from providing new slate, and avoid caring for the old slate during removal. Its easier to throw the pieces off the roof than carry them down, yes? There is also faux rubber slate on the market that you can't tell is not real slate, even up close. So, there you go. I just saved a new friend-of-a-friend about $20,000 in about 5 minutes. A Wardman or not a Wardman? That is the Question. And the answer is most likely: Not a Wardman. Of course, I'm talking about Harry Wardman (right), a builder in Washington, DC beginning about the turn of the twentieth century. Real estate agents often are to blame, advertising just about any house in DC with a front porch and hardwood floors as a Wardman. Most houses by far are not, however, and I'm wondering why my clients that have been told that through real estate advertising and open houses don't sue the damn real estate agents that are making false claims and perpetuating the myth that the guy built nearly everything in Washington. I would. Relatives of the builder and his chief architect are also behind perpetuating the myth, along with a few historians here and there. 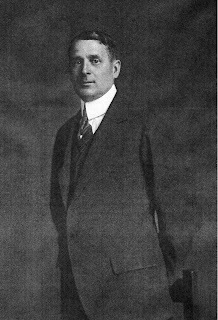 Wardman went broke more than once, and officers in his company were brought up on all sorts of financial charges, before the Great Depression when he went broke for good. You won't find those aspects highlighted by relatives. Now that more documentation has emerged about builders in DC, its been proven that there are equally prevalent builders, many of whom built more houses in DC than Wardman. I'm looking forward to the day when real estate agents begin advertising "built by Warner, built by Blundon, built by Groff, and built by Middaugh & Shannon," for example. Having completed about 1,500 individual house histories in Washington, DC to date, I always wondered why less than 10% of them happened to be built by Wardman. Now I know for sure. This Google map includes the location and basic information of the house histories we have completed to date in the NW section of Washington, DC. Each location has year built, architect, and builder. Enjoy! I'm rotating an offer to certain neighborhood groups in DC our NEW summer promotion for a complete "house history" report! Hopefully, you are already familiar with our thoroughly researched house history reports that document all aspects of your old house; who built it, who designed it and when, and who has owned or rented it over time. 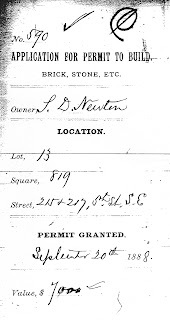 We combine research on deeds, genealogy, building permits, biographies, city directories, census, the Washington Post archives, and other resources for a well rounded and cited booklet. Sometime, we can even locate living relatives of your first occupants that have those rare, historic pictures of you house when it was first completed. By focusing on several homes in one neighborhood, we can offer this for only $450 complete! 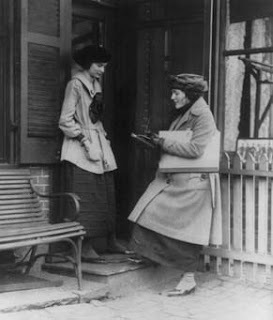 Visit WashingtonHistory.com for samples and more information.